AEM's Wideband Failsafe Gauge provides the ability to accurately tune AFR, while actively protecting your engine by constantly monitoring AFR curves and activating a user-defined failsafe strategy if it runs lean. The Wideband Failsafe Gauge is a Universal Exhaust Gas Oxygen (UEGOyou-way-go) controller with an internal boost sensor, an internal data logger and a full color Organic Light Emitting Diode (OLED) display. It includes technology to activate a failsafe strategy in the event AFR falls outside of a user-defined operating window. If the AFR falls outside of the set operating window, the Wideband FAILSAFE Gauge triggers a user defined output function that can save an engine from catastrophic damage. 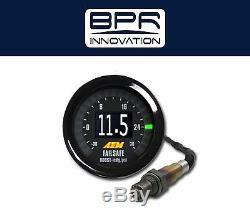 This gauge is a must have for all tuned performance engines, either forced induction or naturally aspirated, fuel injected or carbureted. Any high performance vehicle owners who want a highly accurate AFR tuning tool with internal data logging and a protection strategy that can save an engine from catastrophic failure will want this Failsafe device. Since the Wideband Failsafe Gauge is a wideband AFR controller with an internal boost sensor (up to 29 PSIg), it is able to display AFR and either boost or vacuum in real time on a vibrant Organic LED screen. It also includes an on board data logger that records AFR, RPM and boost/vacuum and can be downloaded and viewed in AEMdata analysis software. The gauge includes a low side output for triggering a failsafe strategy in the event AFR falls outside of the operating window, and an RPM input to log RPM for tuning purposes. The gauges failsafe strategy is completely user definable, from something as simple as making the gauge flash to using the ground output to trigger a check engine light, to cut boost, retard timing, or even switch to a safety map using a standalone engine management system. The Wideband Failsafe Gauges software simplifies the interface set up. Choose displayed parameters (AFR, boost or vacuum) on the center OLED screen and bar graph, set the alarm flash mode and adjust the gauges lighting for a custom look, then install the correct faceplate to match your configuration (6 faceplates to choose from). Bosch Wideband UEGO sensor and weld-in bung included. On-Board 3+ hour Datalogging capability at 20hz per parameter. Intuitive set up software (PC based with USB connectivity). No free air calibration requiredever. Data analysis using AEMdata software. CHECK OTHER PRODUCTS BY BPR INNOVATION. Find more products in our Store. BPR INNOVATION is a fast growing company specializing in auto parts, tools, supplies, equipment, and accessories. We aim to provide best quality products along with fair price and ultimate service. We are committed to excellence and always strive to improve the experience of our customers. Thank you for shopping with us! Any product you return must be in the same condition you received it and in the original packaging. Your address must be confirmed. Buyers who pay with unconfirmed addresses will not be accepted. We always look to satisfy our customers in whatever needs they may have. The item "AEM DIGITAL WIDE-BAND UEGO AIR/FUEL BOOST GAUGE FAILSAFE ALL-IN-ONE 30-4900" is in sale since Thursday, May 12, 2016. This item is in the category "eBay Motors\Parts & Accessories\Car & Truck Parts\Gauges\Other". The seller is "bprinnovations" and is located in San Diego, California. This item can be shipped to United States, Canada, United Kingdom, Denmark, Romania, Slovakia, Bulgaria, Czech republic, Finland, Hungary, Latvia, Lithuania, Malta, Estonia, Australia, Greece, Portugal, Cyprus, Slovenia, Japan, China, Sweden, South Korea, Indonesia, Taiwan, South africa, Thailand, Belgium, France, Hong Kong, Ireland, Netherlands, Poland, Spain, Italy, Germany, Austria, Israel, Mexico, New Zealand, Philippines, Singapore, Switzerland, Norway, Saudi arabia, Ukraine, United arab emirates, Qatar, Kuwait, Bahrain, Croatia, Malaysia, Brazil, Chile, Colombia, Costa rica, Panama, Trinidad and tobago, Guatemala, Honduras, Jamaica, Bahamas, Viet nam.